Around Mom's Kitchen Table: Electrical Science Projects for Kids for Homeschool or Summer Fun! Electrical Science Projects for Kids for Homeschool or Summer Fun! Easy electrical science projects for kids can be fun! 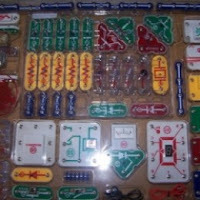 Almost any kid would enjoy doing electricity projects with one of these Snap Circuits sets. The set shown here is very similar to the set I purchased my son when I was homeschooling him. We had him in homeschool from 7th grade through high school. Had I known how much better he would do in his studies, he would have been homeschooled long before he was. With ADHD, public school was difficult for him. Even more so, after we moved from a small town to Memphis, TN, for two years. During my son's home schooling years, I tried to find educational electricity projects that would not only keep his attention, but also help him toward his goal of working in electronics someday. The electronics set I purchased him for school and for holiday gifts kept him busy trying out new things, and sharing what he learned. I also bought him two smaller sets to build a crystal radio and a solar powered fan. We worked together on some of electrical science projects, but he soon outdistanced me in his knowledge and started teaching me! I wish we had had one of these sets, too. I know he would have enjoyed it. Sets like these have tons of easy electricity projects for homeschool, science class, science fair projects, or just for having some fun at home. With the 750+ electricity projects included, this Snap Circuits Extreme SC-750 Electronics Discovery Kit provides hours of fun and learning! After working with a set similar to this one (the exact set he used is no longer available), my son went on to learn about computers, and eventually taught himself the computer technician trade. He even self-taught himself the information he had to know to earn computer tech certifications. And it all started with an electricity project kit. Most electrical science kits are not recommended for children under five years of age. They have small parts that could be a choking hazard if swallowed! Many may include small magnets, which are dangerous and can be fatal if swallowed. Solar Kits are Fun, Too! Your student will learn about solar energy with this Elenco Solar Deluxe Educational Kit . Included in the kit are a fan, light bulb, solar panel, sound box and connecting wires and a 14-page instruction book. Students will learn to increase voltage and amperage, power radios, games and more. Fun Electrical Facts: Did You Know? Hi! I used one of the solar science kits and a radio kit with my son for homeschool. He loved them, and learned a great deal about electricity and radio waves. Good post! Thank you for commenting. My experience is that kids love working with these types of kits.